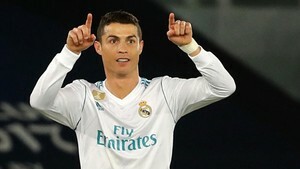 Real Madrid Cristiano Ronaldo once again blew his own trumpet after scoring the goal which won his side the Club World Cup against Gremio on Saturday. Cristiano: "Tengo molestias en el gemelo pero estaré en el clásico"
"What am I going to say... the numbers speak for themselves," he told TVE 1. "I respond on the pitch, I am really happy, I've helped to win the trophy... The team is phenomenal and it's another trophy. Ronaldo said the Club World Cup was a trophy Madrid really wanted to win against a "good" opponent, the fifth title they have won this year under Zinedine Zidane. Finally, he also revealed he played the match in a little bit of pain and said the second half was "a bit tough" but he said he will not have any problems playing in the Clasico next week despite feeling "some problems in my calf -- I am sure I will be OK."